Using a Wii controller with your Raspberry Pi, Gertboard, Bluetooth and Python #piday #raspberrypi @Raspberry_Pi « Adafruit Industries – Makers, hackers, artists, designers and engineers! 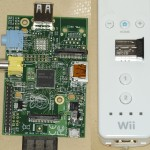 Matt Hawkins from Raspberry Pi Spy has done the leg-work enabling Pi users to use a Wii controller – along with a Bluetooth USB dongle to send inputs to the Raspberry Pi. It uses a Python library called “CWiid” (I imagine this is pronounced “seaweed”). This is awesome because the Wii controller has 11 different digital inputs. When you consider combinations of inputs, that gives you a lot of extra possible “input commands” to play with. Theoretically*, with 11 buttons, there are 55 different 2-button combinations (11C2). That should be enough for most uses. If you need more than that, you could use 3-button combos. How do you do it then? And, happily, they worked first time with my Tesco’s own-brand Technika nano Bluetooth dongle, which has a Pi-compatible chipset. I bought mine in Tesco Extra for about £4. So I think we can look forward to seeing a proliferation of Wii remote controlled Raspberry Pi programs in the near future. Matt’s going to control an RC car with his. After my initial Gertboard experiments, I’d like to see if it’s possible to use two controllers for an interactive Quiz.